This seems to be becoming a TNT (tried and true) pattern for me. It's Victory Patterns Madeleine skirt, and this is number four. I just love the shape and sitty-out-ness of it. I'd been planning this skirt for a while, it's to replace this much-loved skirt which has most definitely seen better days. I bought this skirt about maybe five years ago, and it's been worn/washed so many times that the black is faded and patchy. I lifted it out of the cupboard this morning to throw into the recycling bag, but I think I will hold on to it because I like the shape (it's more of a wide A-line), and I might have a go at making a rub-off pattern of it. I found this tutorial from A Fashionable Stitch on how to do a rub-off, but if anybody knows of any other good tutorials, or has any hints or tips, please let me know. It took me a while to find the perfect fabric. The original skirt is white and black linen/rayon mix, and the fabric I used is cream and black cotton poplin from Minerva Crafts. They don't seem to have the cream and black on the web site any more, but here is a link to the red and ivory. It's £7.99 per metre, I bought 3 metres and used 2, so the rest may become a top. I used my self-altered pattern that I used for Madeleine No2 which has inside pockets, and added some black piping to below the waistband. I also made friends with my invisible zipper foot, which definitely makes a neater zip than the ordinary zipper foot. Unfortunately I placed the zip a fraction too low below the seam allowance, and you can see the gap just above the zip pull; but I can live with it. Also I did a frankly rubbish job of matching the fabric at the back seam. My brain wasn't functioning properly on how to do this when I was cutting it out, but I can live with this too, and I don't think it's too noticeable as the print is so bold. I had big problems with the automatic one-step buttonhole function on my Elna 520. It worked perfectly on my test scrap, which was a cut-off of the waistband because I cut it too long. But it wouldn't play at all when I tried it on the skirt, it kept making the buttonhole too short. I was afraid of putting a hole in the fabric with the unpicking, so ended up making a buttonhole using zig-zag stitches - but that sort of defeats the purpose of having an automatic buttonhole function! I think it was to do with the weight of the fabric in the skirt not letting the feed dogs pull it forward properly. 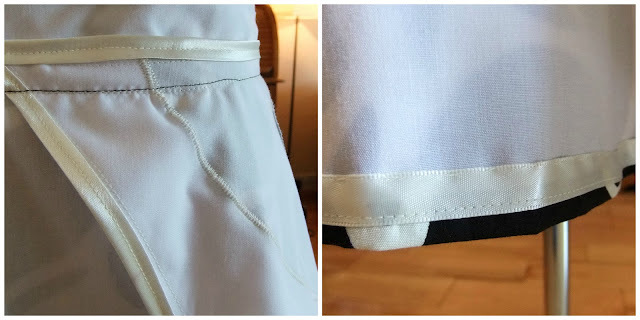 I know this is a common problem with automatic buttonholes because I've read about it on other blogs. If this has happened to you, please let me know if you found a solution! I emailed Elna using the form on the "contacts" page of their website, but the email bounced back undelivered. The same thing happened with the "info" email address. Has anybody else had problems emailing them? This fabric is quite light-weight, so I underlined it with some white polycotton. I edged the pockets and waistband join with cream bias tape, and the hem with cream ribbon. Thank you! Swong is just the right word, I'm going to remember that! Ooh, that's lovely! I've always been put off by the massive pockets but your tweak is making me reconsider! Thank you! I was initially put off this pattern by the braces, and just couldn't see past then. Then I saw a version without the braces, and was sold. The first one I made had the big pockets, but I find that because they are so big, it's difficult to fish stuff out of them. It looks great. I love that fabric, I imagine you will wear it to death. Thank you. It definately will be worn to death! Love the 'twirly' photo at the end. Another great project Lynne! I like the print of your new skirt even more than the old. And those pockets look lovely.